Less luggage. Especially if you are renting boots. Boots are heavy and take up lots of your allowed checked luggage weight. Convenience. 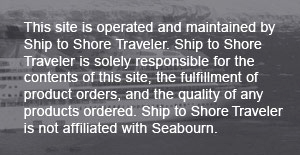 Free delivery to the ship through our Concierge Service. Sustainable choice. Renting is a smart environmental choice if you will likely not wear them again. Cancellation after the "order by" date: No rental refund. Though essential for wading in icy waters during Zodiac landings, the proper boots are bulky and weigh between 4.5 lbs / 2.5 kgs to 6 pounds / 2.73 kgs. By renting boots, you are guaranteed to have the best boot to stay warm and dry while gaining space in your luggage. Our comfortable, insulated boots are essential for expeditions that include landings. They are flexible, durable and comfort rated to - 40 F / -40 C so your feet stay warm. The Alaska Tuf Boots are 100% waterproof and are ideal to wear during Zodiac adventures or when walking ashore. They slip on easily and feature stretchy sides, a heel loop and an anti-slip outsole. Waterproof pants are also essential to stay warm and dry during Zodiac rides. Our rental pants are waterproof, breathable and the pants leg is cut wide enough to fit over boots.